Now that the project is nearing completion has anyone given any thought into protecting the property owner's investment? Unaddressed watershed will damage foundations over time and dripping snow melt can create dangerous icing on walkways and driveways. A compound roof design can channel massive amounts of water that wash away landscaping. Even simple runoff from an eve can cause water to splash up onto siding resulting in discoloration or even ruining stucco. 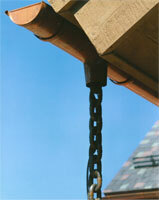 Rain gutters can help eliminate all of these problems. We have a large selection of colors and styles to choose from, if you need something as simple as painted metal residential gutters or something fancier like half-round copper or even something completely custom we haven't found a gutter job yet that we can't handle. Call and ask one of our experienced estimators to look at your property and discuss what the best, and most cost effective, solutions are for your project.